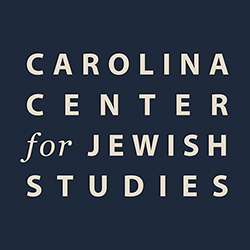 The Carolina Center for Jewish Studies, an interdisciplinary academic program in the College of Arts and Sciences, promotes a deeper understanding of Jewish history, culture and thought through its teaching, research and community outreach initiatives. The Center’s global focus and comprehensive scope of study, coupled with Carolina’s national reputation as a student-focused research university, make the program truly unique among its peers. The Center is a leading institution for Jewish Studies in the American south and a prominent source of research with an international reputation. Established in 2003, the Center has experienced more than a decade of rapid growth and achievement. Looking ahead, the Center plans to further develop its undergraduate program, to increase support for faculty and graduate students, and to expand its public programs. Jewish Studies is an interdisciplinary program with courses offered in departments across the humanities and social sciences. The field of Jewish Studies explores the history, literature, culture and religious life of Jews in their interaction with other peoples from the Biblical period to the present. Both its chronological scope and the range of geographical areas that it explores make Jewish Studies an appealing field for undergraduates from diverse backgrounds. A degree in Religious Studies/Jewish Studies was introduced in fall 2012. The degree program is offered through the Department of Religious Studies, where students earn a Bachelor of Arts degree in Religious Studies with a Concentration in Jewish Studies. This is the first and only undergraduate degree program in Jewish Studies to be offered by an institution in the state of North Carolina. In May 2013, the very first student graduated with the degree: Hayley Wright. A Certificate in Jewish Studies for graduate students was introduced in fall 2012. This is also the first of its kind in the state of North Carolina. Emma Woelk and Elissa Sampson were the first two graduate students to earn the certificate, in 2015. Two academic minors – Jewish Studies and Modern Hebrew – continually attract a diverse group of Carolina students. Offered each year since 2012, the Capstone Course in Jewish Studies, an upper-level research seminar, delves into topics in the diverse field of Jewish studies. A core course, Introduction to Jewish Studies was first offered in 2009 to serve as the gateway into the Jewish Studies major and minor. The number of Jewish Studies courses offered to Carolina students has grown to more than 110. More than 1,300 Carolina students enroll in Jewish Studies courses each year. In fall 2015, 798 students were enrolled in Jewish Studies courses. Students have the opportunity to pursue Jewish Studies through study abroad programs including Israel and Argentina. Students may also participate in archaeological excavations in Israel. The Hispano-, Latin American-, Latina/o-Jewish Cultural Production Working Group is dedicated to exploring the histories, cultures, and cultural productions of Jews in the Iberian Peninsula and Latin America (inclusive of the Caribbean) as well as that of Latina/o Jews or Jewish Latina/os in the United States. The Center co-sponsors this work group. The number of Jewish Studies faculty members has grown to more than 20, based in eight different academic units, including: Religious Studies, History, American Studies, English and Comparative Literature, Asian Studies, Germanic and Slavic Languages and Literatures, Romance Languages and Music. The founding director for the Center was Jonathan Hartlyn, quickly followed by Jonathan Hess who served for ten years, from 2003-2013. In July 2013, Ruth von Bernuth was named director. The Jewish Studies Graduate Student Network is an informal group of graduate students interested in the interdisciplinary field of Jewish Studies. In 2015, there are more than 20 graduate students from eleven different academic departments participating. The Center hosted more than 100 free, public lectures, film screenings, and musical events in its first 12 years, bringing an array of international experts to the campus community and general public. In addition, annual community seminars and lunch seminars for the campus community are also held. The Uhlman Family Seminar Fund, established by a generous gift from Thomas M. Uhlman, Ph.D. ’75, supports an annual continuing education seminar in Jewish history or culture. The seminar is offered by the Program in Humanities and Human Values. Each year, the Center co-sponsors programs with other Carolina departments, Duke University, and community organizations to further enrich the student experience and expand community outreach. In 2013-2014, more than $14,000 was directed to co-sponsor events, more than four times as much as was available in 2008. Since its inception in 2001, the NC Seminar on Jewish Studies has brought together faculty, graduate students, and visiting scholars who discuss various aspects of Jewish history and culture. Monthly meetings discuss current work by either seminar members or internationally renowned guests. Since its founding, nearly $15 million in private gifts has been raised by the Center to support academic and community programs. In October 2017, the University launched the Campaign for Carolina; the Center has an individual campaign goal of more than $9 million. The Center’s Advisory Board, comprised of alumni and community leaders, helps guide the Center’s growth and assists with raising private support. The current chair is Eric Sklut, ’80; past chairs are Hal Levinson, ’78 and ‘’Eli Evans, ’58.